Proposed appropriations bill would prohibit funds for an American embassy or other diplomatic facility in Cuba. 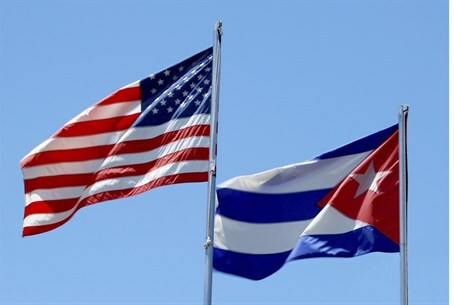 A proposed House of Representatives appropriations bill would prohibit funds for an American embassy or other diplomatic facility in Cuba beyond what existed before President Barack Obama's announcement that he would move to normalize relations with Havana, Reuters reports. The measure, announced Tuesday, also would restrict funds to facilitate the opening of a Cuban embassy in the United States, increase democracy assistance and international broadcasting to Cuba and provide direction to the State Department on denying visas to members of the Cuban military and Communist Party, according to the report. Some members of Congress, led mostly by Republican Cuban-American lawmakers, have objected to the U.S. shift in Cuba policy. These lawmakers want Cuba's government to do more to improve human rights on the island, release American fugitives living in Cuba and allow free elections before easing restrictions on trade, travel and diplomatic relations. "I think we have been very clear with our challenges with what's gone on in Cuba, from human rights, from what's happened there, and we have a difference of opinion with the administration and we have a right to express it," Kevin McCarthy, the Republican House Majority Leader, said at a news conference and was quoted by Reuters. The United States last week officially dropped Cuba from its blacklist as a state sponsor of terrorism, allowing the country to have better access to American banking facilities and aid, and meaning a ban on arms exports and sales is also lifted. Washington recently authorized commercial ferry services to Cuba for the first time in more than a half-century. There have also been indications the two countries will hold meetings on reopening embassies. One lawmaker who is opposed to normalizing relations with Cuba is Senate Republican leader Mitch McConnell, who described the move as a “mistake” after it was announced. "Look at Vietnam," he said. "We normalized relations with them and they are a Communist regime that still represses people. Sometimes engagement works, sometimes it doesn't." Tags:Cuba, House of Representatives, Cuba-U.S.